The online e-commerce business today is trending worldwide and it is gaining momentum at a rapid pace. So, there is a need for an efficient and effective online business and if you are an OpenCart Store owner you are at the right place, you need a website with an awesome user experience that delivers performance and scalability and increased sales. For a store to function at its best, every component of the website must work properly. However today we are here to discuss one of the important Components of OpenCart i.e the checkout process which is considered as the end of the funnel for sales conversion to take place on any online store. 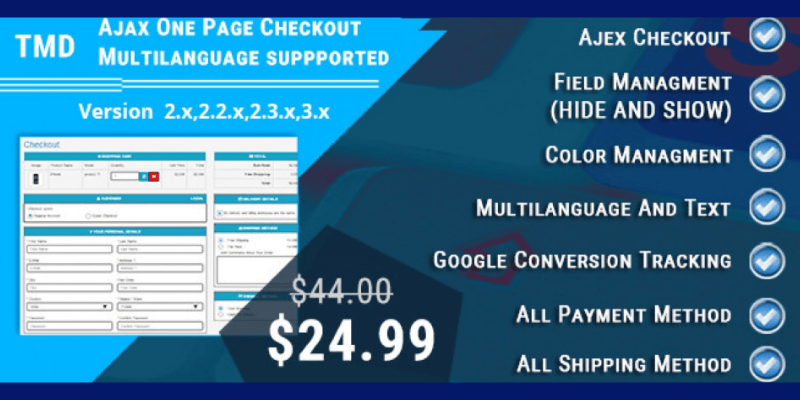 The module is more often termed as one-page quick checkout by store owners, Admin and customers alike. Sources reveal that 10% of customers abandon their checkout because the process is too long and 29% of consumers do not like to register before they make a purchase. So quick checkout is a pleasant scenario for the consumers to truly experience a faster time to process his/her order and this in turn increases the conversion rate for your store. And if you are researching for your store, how to improve the conversion rate? Then this is one aspect of the conversion rate optimization which can’t be neglected at any cost. The more simple are the processes and functions, the more elegant it is for customers to gain traction to speed up the sales process. Therefore the lifecycle to complete orders by consumers from your store should be an easy process and one-page quick checkout should be seamless and a free flow process for target site visitors. Are you missing the checkout scenario for your store, have you encounter more Drop off at checkout? Are you aware of your customer’s experience in your online store? There are actually many different parameters on your store upon which your customers derive the best user experience of browsing and searching for the intended product and finally placing the order. However the check out process is the ultimate and the end of the funnel for a sales conversion to occur. If your customers are finding it hard at this point, it is a serious issue where you lose your customers by 5000% a high breakout in losing the sales. So you must track your google analytics to find actual and valid reasons if your customers are dropping at checkout on your store. Did you know you can measure your analytics report using Google Analytics or Bing Tools? If you are not aware of it ask your developer or your programmer to integrate analytics to your OpenCart Store. Analytics provides good reasons to integrate your website. You can find a valid reason for low conversion or drop-offs. So what I mean here is how do you know if your online customers are dropping at checkout? Integrating your analytics will provide a valid reason to prove it. One of the valid reason for store owners to compete for higher sales and conversion rate is the check out process. If your customers are not completing the checkout process, the issue might be in your check out process. No one would like to be waiting in the queue when customers have already decided to buy. So if you are having more abandoned carts, you also have to have a quick introspection on your checkout process. And as an OpenCart store owner, you need to analyze the gaps and simplify the process for your store. Do you know any website with awesome user experience drives the best conversion? The better is the experience of a user on your website the more likely it is going to convert. A complicated check out process would leave your carts abandoned resulting in poor conversion rate. So it is important to simplify the checkout experience for your targeted customers to enhance your sales productivity leading to high conversions. So a quick check out module for your store is beneficial for your customers, it will provide a good amount of relief. Quick Checkout Module allows store admin to remove unnecessary checkout fields and steps for a quick product purchase. And TMD Quick Check Out process can be very helpful in this case. 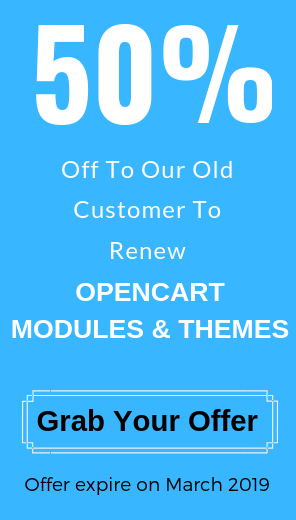 TMD is an official partner of OpenCart Store, it has published over hundreds of modules and extension for the OpenCart community. So it is worth implementing a OpenCart module for your store. The TMD OpenCart Quick Checkout module, seamless checkout experience for your store. 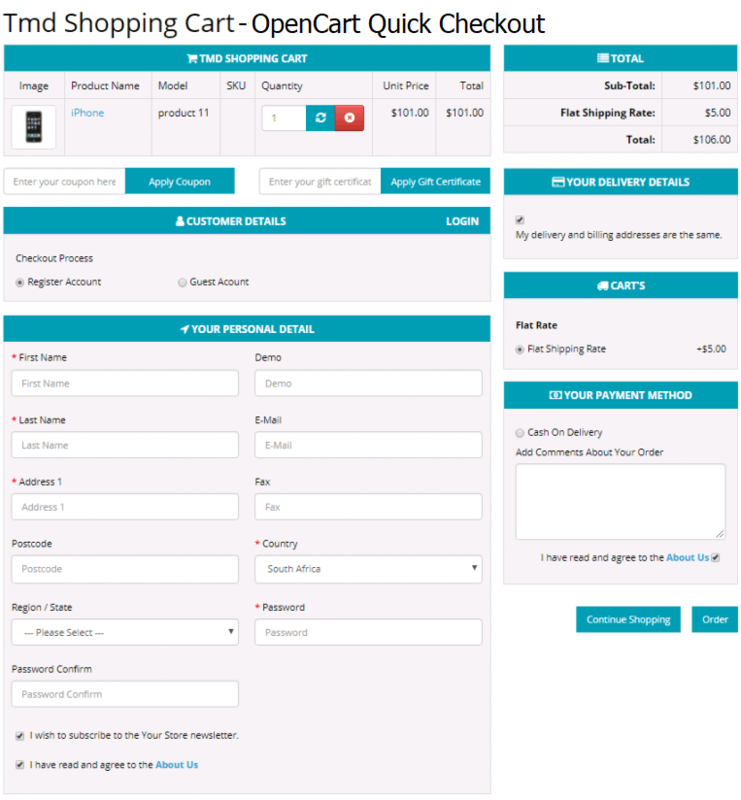 TMD OpenCart Checkout module provides an awesome checkout user experience for your customers. It is one of the best OpenCart quick checkout solution & the Benefits are enormous for store admin and it ensures a higher conversion rate. The module offers detailed cart information with the product image, name, model, SKU, quantity, price and other attributes for your product in one page along with a guest check out or register checkout process ensuring a quick product purchase. It also makes the login and registration process simplified and also allows different devices for browsing the site and an effortless checkout process. You can also add comments about your order during the check out all in one page. It also provides advanced features that can provide a simple and engaging checkout process for your OpenCart customers. So what should you look for an engaging OpenCart checkout extension? I understand as an Admin you need to understand the features and available option available in TMD Quick Checkout, so just give a try and here is the Admin Demo. Get ready for an engaging online shopping experience for your targeted OpenCart customers with TMD Checkout Module with a wide range of features and functionalities that can quickly simplify the checkout process for sales conversion on your store. So do you want to provide a flexible online shopping experience to your Customers? Be one of them today to take your OpenCart store to the next level using the flawless TMD Opencart One Page Checkout Extension. The difficult checkout process is often disappointing and hence consumers leave the checkout process without completing the order. 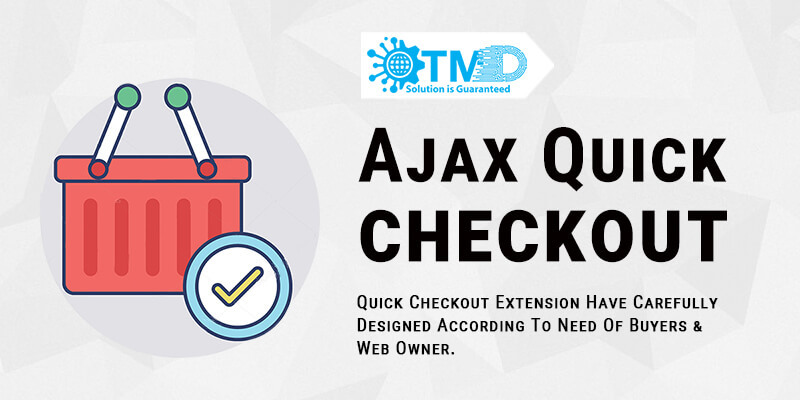 The way TMD Ajax Quick Checkout resolves this is by making the entire OpenCart checkout into a responsive, single-step process. You can change your layout for Desktop and mobile devices individually depending on your needs and for providing an elegant display to your customers. TMD OpenCart Quick Checkout module allows you to modify layout & setting for your Shopping cart, delivery methods, payment methods and auto trigger for order. Field management helps to organize your fields whether you want to show or hide related information fields to your customers. So you can customize the personal detail, payment detail, delivery detail and other custom field setting for your checkout form and select only the minimal required fields you want without making it hectic for your customers. You can also enhance custom fields for more controls and additional settings from the Admin Panel. TMD Quick Checkout OpenCart Module also allows you to define your color settings. Adjust your color settings according to your needs. You can manage your color setting for block background, block color, block border, active tab color, button Background color, button color, blocks heading BG color and block heading text color irrespective of any themes you are using for your store either it is default theme or custom theme. One of the great advantages for store owners is you can also define your own language using the TMD Quick Checkout Module. For example, if your website is in the Russian language, the TMD Quick Checkout module will allow you to configure your mother language for your OpenCart Store. So whether it personal detail, payment details, delivery detail etc this module will allow you to display every information on your store in your own desired language. Google Analytics tracking helps to visualize the main causes of dropout and thereby take action on improving the checkout processes. So based on the data in Google Analytics and consumer behaviour, you can optimize your layout working on the weak points until you get an optimal conversion rate from checkout solution. So TMD Quick Checkout Module allows you to install your tracking code. TMD OpenCart quick checkout solution is a one-page compatible OpenCart Module with all popular payment methods and versatile enough for all OpenCart store setups. The TMD Quick checkout module allows you to configure Payment Methods for COD, Free Checkout and Paypal Pro. TMD OpenCart quick checkout solution is Compatible with all popular shipping methods and versatile enough for all OpenCart store setups. Enjoy both flat rate and free shipping configuration for your store. The successful e-commerce sites are those that are often tracked and optimized by Store Admin for their e-commerce website and for over a period of time. You cannot optimize your entire store at one go, so it will definitely take time to track what is going right and what is going wrong within your store. And if you are failing to meet expected sales conversion you need to expedite your store on pitfalls that are bound to resist your sales. Survey has shown that the very important reasons why customers abandon your store’s checkout are the hidden shipping costs and the necessity for account creation. However, you may know OpenCart has already addressed that situation by allowing Guest Checkout. But replacing your traditional OpenCart Checkout Process with a one-page quick checkout seems even better. Quick Checkout is one of the most important driving factors to optimize your online store for increased sales and it is vital for optimizing your end of the funnel sales process and thereby increase profits for your e-commerce business. Help in engaging your site visitors on your online store to persuade them to complete their checkout order. Enjoy TMD Quick Checkout OpenCart Module and share your experience with us and comments us below so we can improve more on it. OpenCart Marketplace: All you need to know about starting an online marketplace.